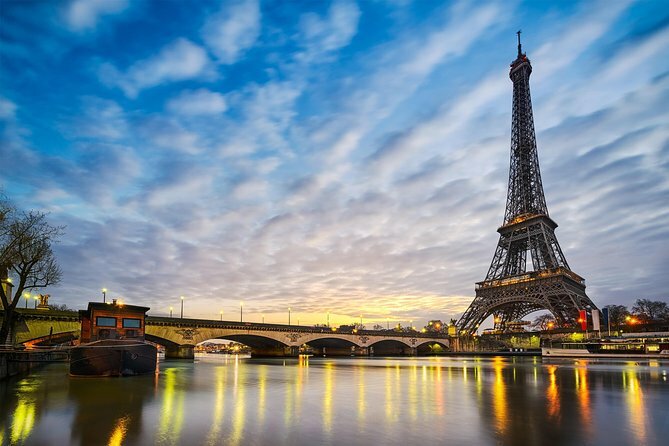 Sip champagne in comfort as Paris transforms before your eyes, with a romantic sunset Seine River cruise. Watch the iconic sights of Paris twinkle magically into life on your voyage to the crown jewel: the Eiffel Tower. Then ascend to the Tower observation deck, skipping hours-long lines, to see just why they call it the City of Light. The voyage begins with an early evening stroll through the Trocadéro gardens, where you’ll have a spectacular view across the city to the Eiffel Tower. Your guide will tell you the rags-to-riches tale of how the Tower, once seen as an eyesore, became the beloved emblem of Paris. When you embark, your small tour group will have exclusive use of the VIP area at the front of the boat, which offers uninterrupted views of the city lights. Enjoy a complimentary glass of champagne, safe in the knowledge that your guide won’t let you miss a thing. You’ll see the Louvre Museum, Notre Dame cathedral and the Gothic Île de la Cité: everything that makes Paris, Paris. Sparkling lights shimmer up and down the Eiffel Tower every hour, on the hour, and your cruise is perfectly timed to end with an up-close view of this transformative display. Finally, your guide will lead you off the boat, all the way past the famously long entrance lines, and up in the elevator to the Eiffel Tower’s second-level observation deck. Here you can buy a ticket to the very summit, or simply enjoy your guide’s stories as Paris sparkles with life and love far below. Rene our guide did an incredible job. He was extremely knowledgeable, personable and made the night very enjoyable. He took extra efforts to point out the best ways to maximize our experience. Our guide, Hugo was knowledgeable and fun. Learned a lot more than we would exploring on our own. The cruise also helped us understand the layout of the city better. Tour guide was very informative and fantastic. and Seine River Cruise with champagne tour, was the highlight of our vacation in Paris. I highly recommend this tour. The meeting place was very easy to find, we were met by Felix and Will. It was a surprise to find out that we would not be getting on the boat until 8:25, and that the Eiffel Tower tour would happen a lot later than we thought, therefore we had to cancel our dinner reservation for my friend’s 50th Birthday. Will was an excellent guide who gave us lots of interesting history and information about the area and the Eiffel Tower. He asked us questions which was a nice way to encourage group participation. It was disappointing to miss our dinner we did not get back to our hotel until 11:45 and ate dinner at a restaurant near our hotel. Overall great combo tour. Especially our guide. He was extremely vivacious and talkative and knew so much about the history of Paris and the Eiffel Tower! Champagne wasn't bad either. :-) Lovely evening. Highly recommend it!! This trip was perfect for our first night in Paris. Seeing the Eiffel Tower while skipping the line is definitely the way to go, and the Seine River Cruise gave us a wonderful overview of the city and what we might want to see in our remaining days in Paris. And all while sipping champagne! Our guide was knowledgeable and friendly. A great experience. Got to the meet up location early, first ones there. They waited until everyone was there and started handing out the audio gear for the tour, they were short 6-7 headphones. So we did not get to hear 90% of the tour. The guide was very nice and apologetic but I booked an audio tour so I could learn the most I could in a short time. We were on the summit for about 20 mins or less then rushed back down, didn't even walk the full area, stayed in one spot. Then we walk very briskly to get to the cruise dock and wait about 25 minutes for the boat to show up, we could've used that time to be up on top of the eiffel tower. Would not recommend doing this is if you are counting on this to be informative, reliable and your only tour for your stay.